ICC World XI Cricket Team Visit Pakistan Update: Chairman, Pakistan Cricket Board,Najam Sethi said on Wednesday that World XI will again visit Pakistan in year 2018 and 2019 to help promote international cricket in the country. The visit of World XI has paved way for international cricket to Pakistan and apart from the visit of other foreign teams the World XI will also undertake visits of Pakistan in the successive years 2018 and 2019,he told media. ICC World XI Cricket Team Visit Pakistan. ICC World XI Cricket Team Visit Pakistan, Chairman PCB said after the three match Independence Cup series between World XI and Pakistan, Sri Lankan and the West Indies teams will be visiting Pakistan to play T20 matches. He termed the successful holding of the Pakistan Super League final earlier this year ‘the game changer’ for cricket in Pakistan and said it helped in changing perception regarding Pakistan cricket in the world. ICC World XI Cricket Team Visit Pakistan. 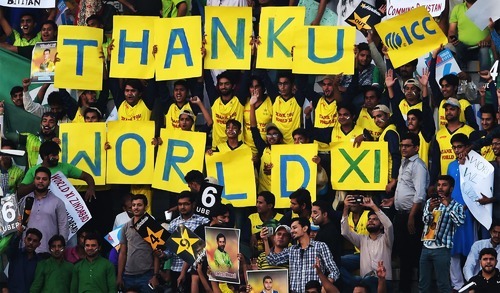 Chairman PCB said apart from the efforts and contribution of the government and the concerned departments, the credit to make the World XI tour a success goes to the people of Pakistan who prayed a lot for the happening of the tour of World XI. ICC World XI Cricket Team Visit Pakistan he said PCB will soon hold discussions with the cricket playing countries for sending their teams to Pakistan to continue its efforts for the cause of international cricket in Pakistan. To a question, he said the matches of the Pakistan Super League will also be organised in Karachi and international cricket matches will also be staged in the port city to bring international cricket there after establishing the faith and confidence of foreign players and teams. Mehran Post is an is an Online NEWS Service provides latest information and press releases on Defence, Autos, Telecommunication, Science and Technology, Coomputers, Internet, Entertainment etc. etc. Mehran Post is also an E-Marketing and SEO Company offers services in Internet Marketing, Search Engine Marketing, Content Writing and Social Media Marketing. Mehran Post is aim to introduce remarkable Pakistanis in their respective field and target to introduce the positive face of Pakistan which is a real fact.